I played that card so many times in my first year. But, actually, it’s something I still go back to all the time when I slip into perfectionism or when I find myself replaying all the mistakes I’ve made in thirteen years of teaching. I’ve come to believe that this New Teacher Card is something you should never let go of in teaching. Although you grow in knowledge and expertise, you will always remain imperfect. But I think the New Teacher Card is more than just a forgiveness card. It’s a reminder to keep experimenting and trying new strategies and testing out new ideas. The New Teacher Card means I’m open to new possibilities. It means I’m willing to take creative risks. I’ve played this card when I first tried out sketch-noting or student blogging or Genius Hour or cardboard challenges or documentaries. The New Teacher Card reminds me that every single lesson is an experiment. It might work. It might fail. But the biggest risk you can take is not taking the risk at all. 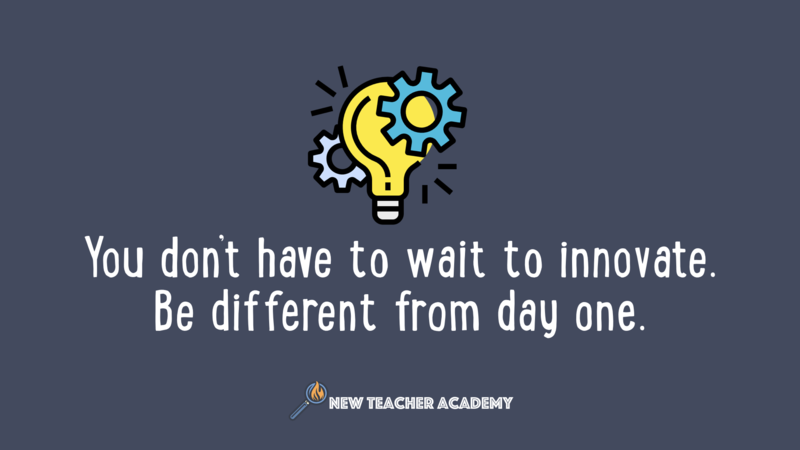 Think of the New Teacher Card as an invitation to innovation — to rewrite the rules of teaching and to experiment with new ideas and transform your classroom into a bastion of creativity and wonder. But then it never happens. They are stuck in a rut, afraid to make mistakes, waiting for that moment when they “have it down” enough to take creative risks. See, the hidden advantage of being a new teacher is that people know you will make mistakes. You have the permission to be different from day one. So I’d argue that you should always have a new teacher card and you should play it, not only when you screw up, but every single day.